A cervical medial-branch block is an injection administered to diagnose and treat neck, upper-back, shoulder and facial pain, and headaches. The procedure is designed to both relieve symptoms and diagnose their source. By deadening pain signals in the medial-branch nerves (which transmit pain signals from the facet joints to the brain), it is possible to determine whether a particular facet joint (which connects two vertebra) is the source of the pain. During a cervical medial-branch nerve block procedure, an anesthetic and a corticosteroid are injected near small medial nerves connected to a specific facet joint. The anesthetic provides immediate but temporary pain relief; the corticosteroid provides long-lasting relief a few days later by reducing inflammation. 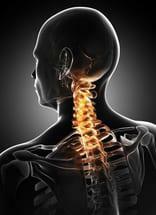 The procedure is usually performed in an outpatient surgical center. A patient is given intravenous medication to help with relaxation. The skin on the back is cleaned, and a local anesthetic is applied. The targeted area is pinpointed using X-rays and contrast dye, and a small needle is inserted near the medial-branch nerve. Once the needle is situated properly, the injection is administered. It can take as much as a week for the injection to provide full pain relief. A patient can return to work or other normal activities the next day. Results of a cervical medial-branch block vary. If the patient's pain is cut in half (or more), it is considered diagnostically significant because it indicates that the pain is being generated through the medial nerve. If this is the case, the patient may undergo radiofrequency ablation, which is helpful for a longer time, usually between 6 months and 1 year, than the injection. Common side effects of a cervical medial-branch block are pain and soreness at the injection site. And, although rare, a cervical medial-branch block does have some serious risks. They include bleeding, infection, bowel and/or bladder problems, nerve damage and sexual dysfunction.